Who among us doesn’t enjoy a good story, dear readers? Personally, I enjoy a story in which the hero undertakes a great journey, learning about themselves and changing along the way. They might undergo great hardship, they may face mighty perils, luck and fate may combine to weave them a tapestry of adventure and achievement- what matters is that our hero goes somewhere and does something. And the more things your hero does and the more things that happen to your hero, well- that just makes the story that much more interesting, doesn’t it? Tales of the Arabian Nights is a game that asks that very same question. This is an adventurous storytelling game for 2-6 players published by Z-Man Games, with games lasting around two hours (but that can vary greatly). Inside this massive box, there is a board, tokens and counters galore, some dice, and a massive amount of cards. But the most important thing in this box is a thick, spiral-bound book called The Book of Tales. 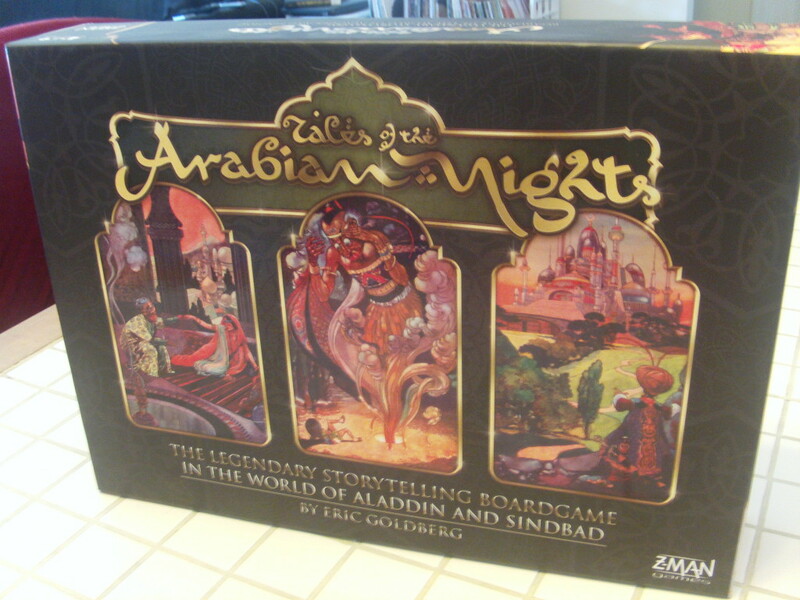 You see, Tales of the Arabian Nights is a game about adventure, certainly- your character will undertake quests, will uncover fabulous treasures, may even find forbidden love along the way- but ultimately, this is a game about stories. Every time you move to a space on the board, you’ll uncover an Event Card, which will ultimately give you a number. The person on your left will use that number to look up a table (one of very, very many). With the roll of the dice, your encounter will emerge from that table and you will have a variety of options as to how to deal with it. You’ve stumbled across a love-struck hunchback as you’re walking down the road. What do you do? Do you attack him? Rob him? Aid him? Pray with him? Your decision will result in a number. The person holding The Book of Tales will look out that number, which will provide them with a paragraph to read and give you the result of the encounter. 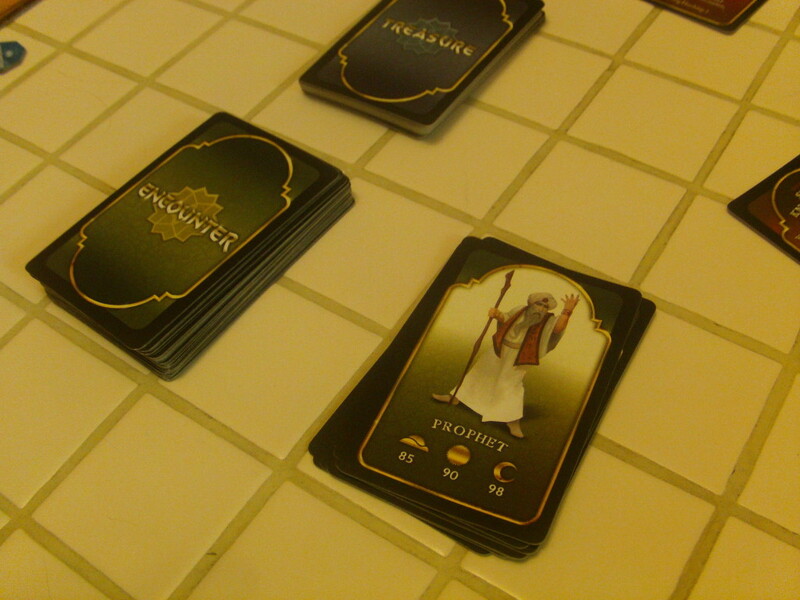 Then it is the next player’s turn to move and see what befalls them. What I’ve described may seem complicated (and believe me, I have simplified the process somewhat so that you at least get the gist of what it entails, dear reader) but in practice, it soon becomes second nature, becoming easier and easier to do as the game progresses. What enfolds is an adaptation of the “Choose Your Own Adventure” novels that so many of us enjoyed as children. You move somewhere, something happens, you make a decision, turn to a page and there is your result. What’s more, there are these wonderful things called Status Cards that are always face up on the table, taunting you with what may befall your character. Certain encounters will result in you picking up a specific Status Card. Your character may become Love Struck or Scorned, they may become Blessed or turn into a hideous Beast Form. What this means is that the decisions you make may have lasting effects on the options throughout the rest of the game. Some of these statuses can be removed from your character, but some have a rather permanent quality to them. 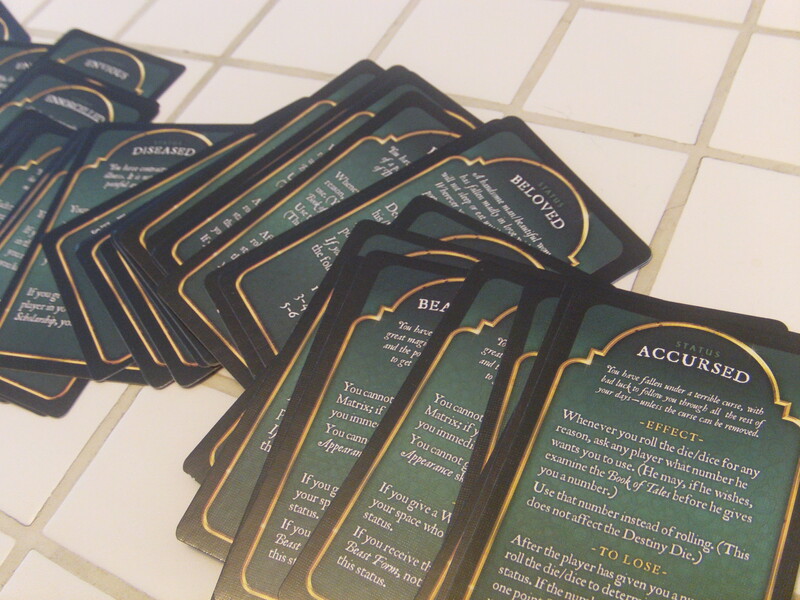 The result of all this is that as you have different things happen to your character, you’re weaving together a fantastic story with reminders of what happened to you in the form of these cards. What fate will befall you as your adventure continues? You may be asking (and rightly so) what the point of all this is- what’s the end goal? 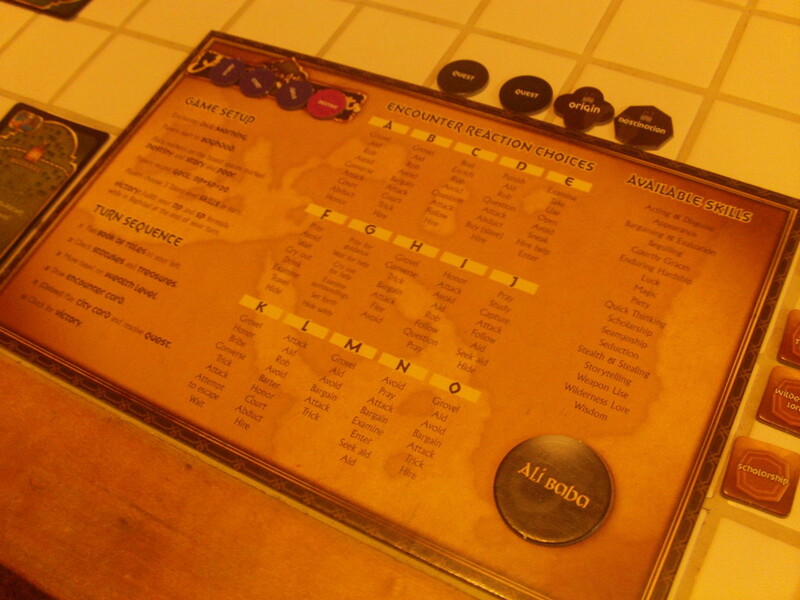 Well, at the beginning of the game, each players secretly chooses a value each of Story Points and Destiny Points for themselves (the two of which combined must equal 20 points). As you continue along on your adventure, completing quests and undergoing great trials, you may learn skills, earn Story or Destiny Points or even lose some. Once a player has met their goal level of Story and Destiny Points, they just need to make their way back to Baghdad (and since they have had such an epic adventure) they win the game! 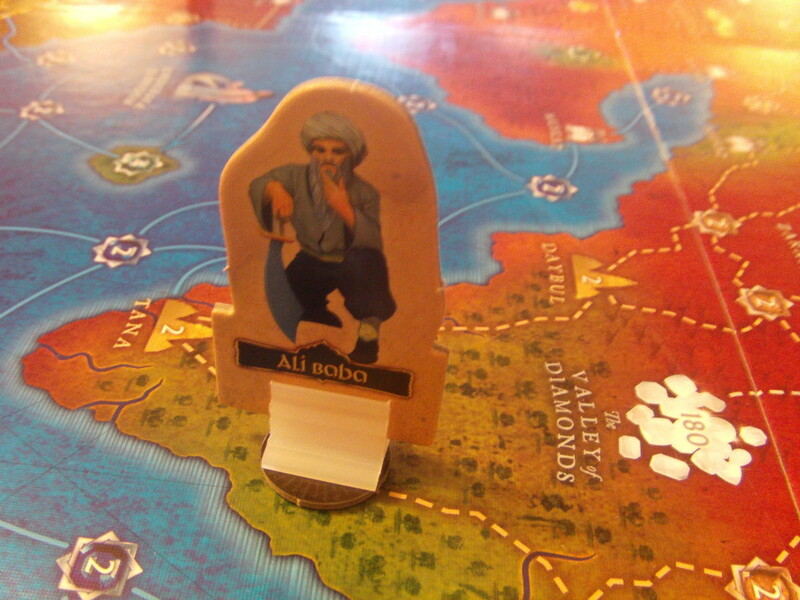 So, what do us here at A Space Ahead think about Tales of the Arabian Nights? Well, let’s start with the plusses, shall we? First, there is an incredible amount of replay value in this game. 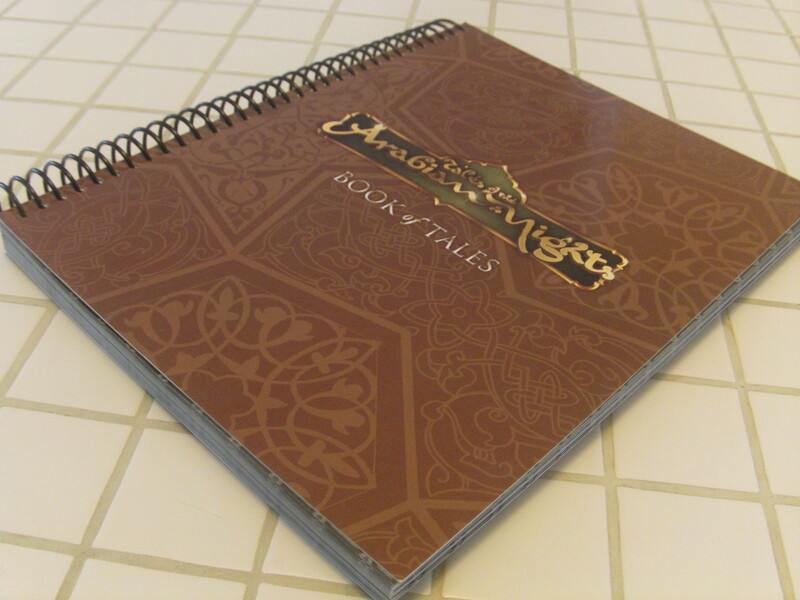 The Book of Tales is a massive tome, just full of possibilities. You may come across the same encounter more than once, but depending on what you choose to do the results of that same encounter can vary greatly. Second, the art design is beautiful- so much so that we were remarking that we wished there was more of it. The manual is filled with gorgeous illustrations, but once you get into the thick of it, these instructions will be set aside never to be opened again. So we had to make do with the tiny but luscious illustrations available on the encounter cards. Last, this game accomplished precisely what it set out to do- it made us feel as if we were telling the stories of the characters. One of our players insisted on robbing a Friendly Mermaid at the very beginning of the game and that character trait followed her throughout the rest of the game (mainly through the taunting of the other players.) This is the kind of memory-making experience that gives games their meaning. How will you deal with the problems that face you? In the end, these are but minor quibbles. 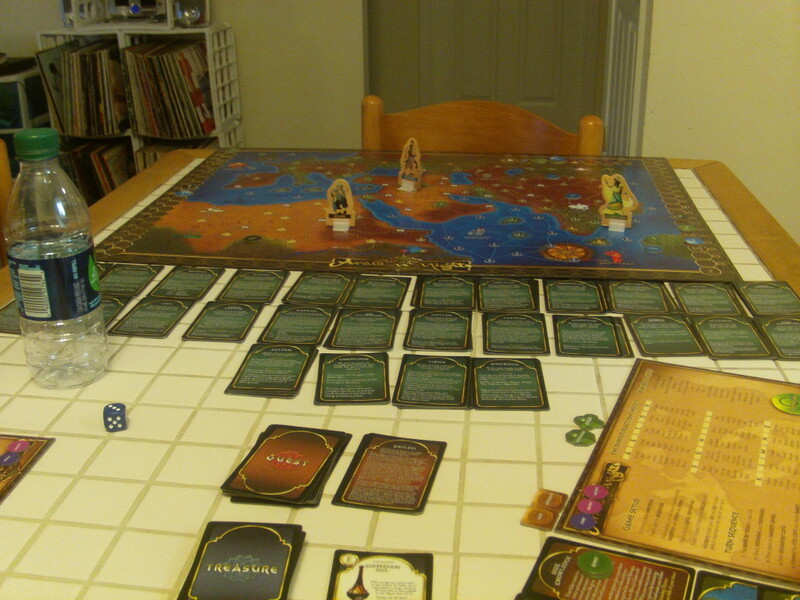 Tales of the Arabian Nights is a fabulous experience for both player and spectator alike. This is a game that has heart, it has a real passion and that shows in its playing. This game has a lot of moving parts, but at the same time doesn’t feel overly complicated. While the encounters don’t always make sense, as we were playing the game, we didn’t really care. We were sucked into our adventure and the weaving of our own exciting tale. This is a game that you will play and instantly create memories and stories with your friends. As soon as a game ends, you’ll be discussing what happened to each other and laughing, reveling in the shared experience. And so Tales of the Arabian Nights does what every great board game should- it brings people together and creates shared memories. And for that, A Space Ahead strongly recommend that you not only try Tales of the Arabian Nights, but that you add it to your collection.